Twenty four years since she first set foot in Peru Andean Trails’ Kathy is heading back to some of her old haunts with her 10 year old son. The plan is to trek in two of the big mountain areas just near to Cusco : Lares and Ausangate – both very familiar areas with lots of trekking routes, but on this trip Kathy will be seeing each of them from a new angle. I am just beginning to finalise all the details of our trip, to pack, pull together all the various bits of paper I need and buy any last minute supplies. It is currently the end of the rainy seasons in the high Andes of Peru so we might still get some wet days, but hopefully not too much rain. I am really looking forward to getting into the mountains. For me this is the best time to go to highland Peru because it will be at its very greenest, and stunningly beautiful. We have two treks planned, one into the Lares area, where I haven’t been in a good few years, and the other to see a new community tourism project in a small community in the Vilcanota range, to the south of Cusco. I am usually very happy to sling on my back pack and head off into the wilderness with just a tent, a stove and some packets of freeze dried food. On this trip though we are going upmarket on our Lares trek and will be staying at luxury lodges, with large en-suite rooms with wifi ( a mixed blessing) and sitting down to eat gourmet meals. I’ll report back on how that feels. I wonder if that level of luxury detracts from the wilderness experience. Our second foray into the mountains will be in the Ausangate area, where one of our long time trek cooks, Felipe Quispe, comes from. He and his family have established a community tourism project and I am very keen to go and check it out – to join in with the family and plant or harvest potatoes (I am not sure which we’ll be doing a this time of year), milk the cows, make cheese, herd the llamas and generally getting involved in all the daily chores. We’ll hopefully have a few days then to head up into the higher mountains to enjoy the wilderness. Our base between treks will be the lovely historic centre of Cusco. It is always a pleasure to be there and over Easter there are sure to be plentiful colourful processions and probably dancing. Most festivals are a fusion of Andean and Catholic beliefs and we’ll just be there in time to enjoy the festival of the Señor de los Temblores, a celebration in honour of a statue of a black Jesus who is said to have saved the city from an earthquake. I’ve never been to the community run Parque de la Papa, the potato park, so we’ll go and have a look at this just outside Pisaq. It was established in 1997 to help with the conservation of the indigenous heritage of the area, and the 1400 varieties of native potatoes being grown in the Sacred Valley area. Plus we’ve many old friends to see and new hotels to check out, so it’ll be a busy trip, but lots of fun no doubt too. 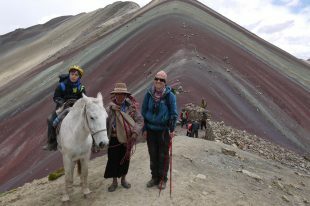 If you are interested in planning a trip to Peru then do get in touch with Andean Trails.